Your dog will love the liver-flavored wafers. Most customers see results in the first 2 weeks. "THANK YOU! I HAVE BEEN A CUSTOMER SINCE 2012. BUDDY AND I LOVE YOUR PRODUCTS." "MY DOGS LOVE THE PETMIX & SUPPLEMENTS. I WAS BLESSED BY FINDING THIS SITE & TAZZ IS MY MIRACLE 4 LEGGED CHILD!" Read more verified customer reviews on Shopper Approved. Your dog deserves the best! *Full satisfaction guarantee. Money-back guarantee for first time orders. If you are not completely satisfied with the results you see within your first 30 days of this Critical Care Power Pack, send back the open and unused portion of the supplements, and we will send you a refund. Shipping not included. 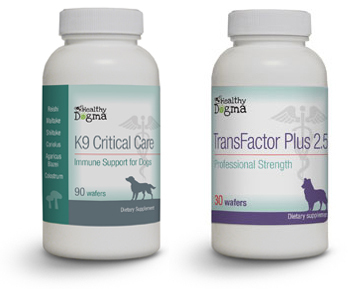 Healthy Dogma is the only U.S. pet supplement company offering hot water extracted mushroom supplements that match the potency and quality of the preparations used in Traditional Chinese Medicine, as well as the extracts used and studied in scientific and medical research. Few people realize that hot water extracts are the only kind of mushroom supplements ever used or studied in the scientific research and the only method of preparation used in traditional herbal practice. Other mushroom companies sell mushroom and/or mycelium tinctures preserved in alcohol (a.k.a. “cold water extracts”), or unextracted mycelium powder (made by growing mushroom mycelium on sterilized rice). These supplemental forms have never been studied in the research, have never been used in traditional herbal practice, and are a fraction of the potency as compared to hot water extracts.